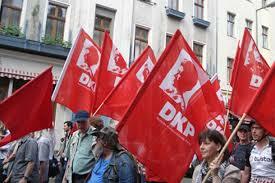 The DKP declaration, signed by the Party leaders Patrik Köbele, Hans-Peter Brenner, Wera Richter, referred to the march for peace that took place last weekend, under the motto “Disarm, no further arming”, which was also one of the resolutions of DKP addressed in the recent Party Congress. The statement argues that although the majority of the German population in against war, the scenario of threat posed by the Russian Federation is kept alive by the representatives of Western politics and the help of mass media. The most recent example of this is the so-called toxic-gas poisoning case of Skripal, in which the British government directly assigned the responsibility to Russian government, without ant proof. Following that, and despite obvious contradictions, 140 Russian diplomats were expelled from their positions in 25 countries including the Federal German Republic. The DKP denounces the policy of NATO, which was also carried out by the former and recent Merkel governments, that resulted in the dangerous tightened the relationship with Russia in the past years. For the Skripal case, the DKP calls for an international investigation including specialists from Russia, just as stated in the chemical weapons convention. The DKP demands from the Federal government to “find a way that will reopen a detente policy with Russia and will resume a political discussion process with rationality and objectivity”, for peace and a good neighbourhood relationship with Russia. See the link for the full text in German.